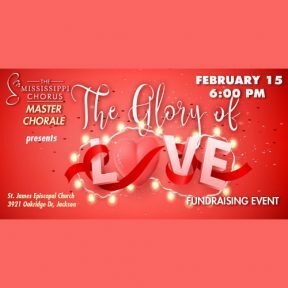 The Mississippi Chorus Master Chorale and The Brick Street Trio will perform music from the “Great American Songbook” (40’s, 50’s and 60’s). Dance, enjoy sweet treats and drinks, and spend a fun evening with that special someone in your life! There will also be a silent auction that includes some amazing items! You do not want to miss this event! Tickets (above) are $20 per person or reserve a table for 8 for $150.